Its hard to believe its nearly April , with the cold easterly winds and the significant snow fall we have had recently. However despite the artic like conditions and the freezing water temperatures the fishing has been superb. All methods have been producing and anglers have been experiencing equal levels of sport from both boat and bank. Venue regulars and Hawkshead Angling Club members Bob Swann and Colin O’brien experienced hectic sport as they practiced for heat 1 of the Esthwaite Pairs match. The deadly duo landed 10 fish between them on intermediates and dabbler combo’s. The pair boat fished and found the fish in a taking mood at the car park end of the lake. Kayaking legend Andrew Hoyle fished from his contraption with float fished worm and landed a fine conditioned brownie of 5lb 4oz, again the ticket office frontage produced the goods for this Manchester based angler. (see attached photo). Our open day on Sunday March 17th was a huge success. The first heat of the Esthwaite 2013 pairs match was won by Competition regulars Tom Nelson and Jon Henderson who weighed their 12 fish in with time to spare, with a total of 13lb 5oz. In second place Esthwaite Peregrine members Ali Beaumont and Dave Morris weighed in their 12 fish and also gained a time bonus with 12lb 1oz. Both pairs now qualify for the final in September. The next heat will take place on Saturday 20th April. Also on open day we had a fantastic Fly tying demonstration from James Atkinson and Jon Mackintosh, members of the England Youth squad who kept everybody entertained in the tackle shop. Meanwhile Ian Jones one of our resident instructors gave a first class fly casting lesson on the far bank. Don’t forget this week is the last chance to catch a Pike of a lifetime as our season for the Pike fishing ends on 31st March. There have been one or two fish out. 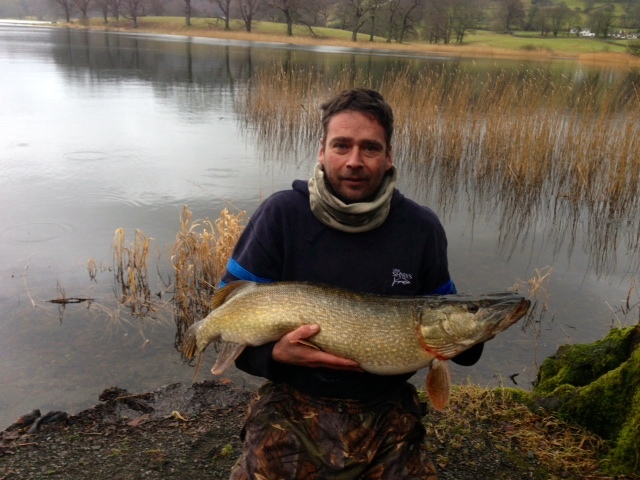 Indeed John Bullock from the midlands hired one of the Esthwaite guides and took a fine 25lb 2oz specimen on a lure at the car park area of the lake. Meanwhile John Ashurst and Stuart Fazackerley from Wigan managed 2 jacks and 2 low doubles to 14lb on a combination of lures and deadbaits. 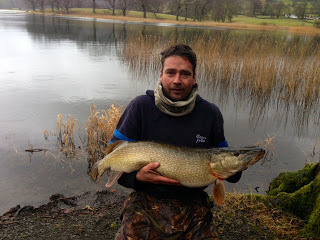 Terry Brown also managed a 14lb 5oz Pike on a lure from the boats. Our next discounted tuition day will be on Sunday 21st April. These sessions are not to be missed if you want to take up flyfishing. They are 4 hours in duration and they only cost £10. The sessions start at 10am and run until 2pm. All participants need to do is book in at the ticket office and turn up with a brimmed hat and a pair of sunglasses for protection. Those that don’t have an EA licence can purchase one for the day for £3.75. Just ask a member of staff on arrival. For the most up to date information please telephone the ticket office on 015394 36541 or find us on Facebook or follow us on Twitter! The trout fishing season has got off to a flyer, with all methods producing well. The freshly stocked fish have been slow to disperse, because of low water temperatures and so the ticket office frontage has been the hot spot to head for. However good numbers of fish are also being caught down at the car park area of the lake and also along the reed bed and into Strickland Bay. Both boat and bank anglers have been experiencing good sport and reports of double figure bags have been common place. Fly anglers employing early season tactics of black and green lures on sinking lines have been highly successful. Indeed venue regulars Bob Swann and Jon Henderson fished from the boats last week and got stuck into plenty of fish outside the ticket office. Between them they landed 24 fish. Paul Alexander and Al Pross from York, both new to fly fishing took 6 brownies between them, again just outside the ticket office. Black and green cats whiskers on slow sink lines from the boats was the winning tactics for these boys. Paul Cooper from Preston had a session to remember landing 23 browns and rainbows to 3lb+ from Strickland Bay. Again early season tactics of sinking lines and lures was the successful method for Paul. Bank anglers fishing outside the ticket office have been busy, indeed Hawkshead Angling Club members Jamie Timmins and Shaun Hunter from Barrow landed 12 browns between them on spinner and float fished worm tactics. Another H.A.C member Dave Bell also landed a brace of brownies to float fished worm. Also fishing from the bank John Dawson from Wigan took a 9lb 8oz rainbow from the boathouse banking on worm and sweetcorn cocktail. Our open day is Sunday 17th March. The day will include heat 1 of the Esthwaite Pairs competition, discounted flyfishing tuition and general camaraderie. There will be a fly tying demonstration offering practical tips and you can learn how to tie from members of the England Youth squad. Also special offers on fishing tackle will be available on the day, so anglers can ‘try before they buy’. There will also be complimentary food and drink. Feel free to come and chat to our friendly staff, everyone is welcome. Please contact the fishery for further details. Its been quiet this week on the Pike fishing front, however Stuart Fazackerley and John Ashurst from Wigan have been doing very well will a succession of jacks and doubles to 20lb 8oz. All taken from the boats on deadbaits and lures. Don’t forget our Pike season finishes at the end of March, so its last chance to bag a fish of a lifetime as the Pike will be at their heaviest weights. Also find attached a picture of John Ardens 20 pounder from the car park swim . He got a mention in our last report!